"Golden Arrow Made In USA". Click on the pen that looks like Yours! The Golden arrow are known to exist in black or grey and a clear plastic version which was a Demonstrator and was not part of the regular line. ost Golden Arrows that have survived have Vacuum Filler nibs, one nib exist with the imprint "Golden Arrow", a few others have a separate gold arrow soldered on top of the platinum plated nib for a 3D-appearance, some nibs have a large gold "V", pointed towards the tip. Very few demonstrator items exist. The Golden Arrow and Vacuum fillers exist in many variations, not subsequently found in the Vacumatic line. There are items with a one piece barrel-section assembly, while most are in two pieces. They exist in both red and white gold trim on black pens alike. Sizes also vary. Items have been found only 109 mm long when closed while others are equivalent to the later 112 mm sub Juniors etc. Since the Top line/Bottom line differency is not applicable, there are in fact bottom-line style pens with top-line style three rings and vice versa. They do come with the lock-down filler, striped sections, striped or black jewels. Some have top rings, rather like the earlier Duofolds, notably the "Stub" pens, while most have the new arrow clip. Very few Golden Arrow pencils have been found, but these are in most respects similar to the later (pre 1935) Vacumatic pencils. hese pens were made in a very brief period between July 1932 and November 1932 and are exceptionally rare. Parker Golden Arrows. The Demonstrator was not part of the line. Most Golden arrows have the 1932-1933 "Parker Vacuum Filler Made in USA" nib (right), the one to the left is the1932-1933 extremely rare arrow nib with the arrow soldered on top (approximation), unfortunately I don't have a true image of this nib, nor the Golden arrow nib. 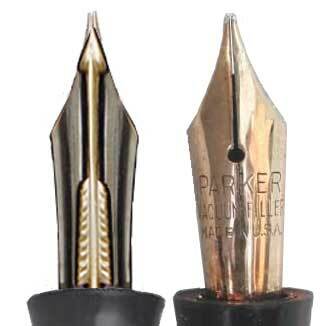 The nib is the most commonly exchanged part of the pen and many pens have factory fitted replacement nibs. For more nibs found on later models take a look here.